The significance which is in unity is an eternal wonder –Rabindranath TagoreAnxiety, excitement, uncertainty. These are the three words or rather it would be apt to say, the feelings that surround a prospective B-school aspirant day in and day out after clearing one of the toughest entrance exams i.e the Common Admission Test. The desire to stand out from the crowd, desire to rock the corporate world, desire to excel in whatever comes in our way. There is a thump of adrenaline rush flowing in every B-school aspirant right after declaration of CAT results. The commencement of 13 new IIMs a decade ago has provided the opportunities for other bunch of talented pool to get themselves IIM branded and bring prestige to their families. On the other hand, it has also generated a sense of confusion among aspirants as to which institute would be optimum for me in terms of placements, faculties, right environment or rather will it be a good cultural fit and extract the best ROI possible. I, like other thousands was in same dilemma and encountered the similar kind of situation when I cleared the CAT exam and was flooded with a host of thoughts, both positive and negative. Given the limited viable options available I had and scarcity of time and resources, there wasn’t an iota of mistake that I could afford to commit in choosing an excellent B-school where I could extend my limits, hone my skills and talent and get an ample opportunity to nurture my potential. Thus, there was no second thought I could give when I got the offer letter from IIM Amritsar,the best B-school among third gen IIMs and at par with other second generation IIMs based on its achievements and accolades it has garnered in past three years. Situated in the holy land of gurus, the land of Golden temple, Amritsar is truly a heavenly abode on earth. The city has excellent air and land connectivity given the extent of inbound tourism this city witnesses each day. Now, very few will not subscribe to the fact that one of the factors to consider and zero in on a B-school is that it should have a decent connectivity. This brings in equity and value for a B-school as well as its students,faculty,recruiters and other stakeholders associated as it helps in easy transit. One of the reasons which distinguishes a B-school from other is the kind of students they admit and what those students bring to the table during those two years. The diversity of batch in terms of work experience, academic and gender brings a very different perspective and viewpoints in class discussions and this results in the output being a logical one. One of the reason I decided to pursue MBA from IIM was the kind of networking this institute offered, although Amritsar was only three years old,but still the kind networking opportunities it provided was going to be very helpful in corporate career ahead. Also, being doubled the batch size right in the second year of its commencement gave an opportunity to interact with colleagues more often. The curriculum and requirements of this course is such that even the person who tends to be the most introvert will need to change his attitude and be more expressive. Not to mention the group projects,assignments,case discussions,presentations blended with co-curricular and extra curriculur activities bring out the best out of an individual. Being a new IIM has its own advantages. We get an opportunity to explore and propose new events to the administration,set out the budget and get it done rather than transiting on the usual rules and processes. Also,being a new IIM, we are taught by professors from other top IIMs who bring the academic rigor with them, which is essential for a new IIM to nurture its students. Students of IIM Amritsar performing on inauguration day of Aarunya’18. IIM Amritsar is the only institute having organized one of the largest management & cultural fest [Aarunya] in north India right in the second year of its operations. The minutes of the event right from managing sponsorships, hospitality,logistics was entirely managed by students of the institute. Students managed the events kind heartedly rather than to just get a CV point. Close to 2000 Students from top B-schools all over the country enthusiastically participated in the management and cultural events hosted by IIM Amritsar. The traits of a successful manager is not in being academically and conceptually sound, but in managing the day to day activities and events of this scale. In this aspect, my colleagues at IIM Amritsar displayed a very strong traits of a manager. We excel in each and every domain we step in be it sports,academics,cultural, extra-curriculars which has helped us to become a well-rounded personality. I don’t think of any other IIM that has achieved this reputation in such a short time span. Placements are another important reason why most of the students tend to pursue an mba from an IIM or any other top b-school. The most important factor in placements is the kind of companies offering roles and the profiles offered. While other new IIMs are struggling to get their students placed with good package, IIM Amritsar, with its dedicated placement committee has till date achieved 100% placements in top companies both for summer internships and final placements. This has certainly raised the graph and reputation of our institute and generated a sense of assurance in the minds of students. No doubt, the credit goes to its quality students, support from faculty members and their sheer perseverance has made this possible. With lakhs of students competing every year for few handful of IIM seats, there has been a sense of extreme competition among students to excel in the exam. Its good to have a competitive spirit but at the same time it is equally important to understand our limitations at an individual level. The decisions which we now take will certainly impact our personal and professional lives in the long run. I believe every student is unique in his own way, every student has a different reason/perspective about the B-school and also their expectations are different. It is therefore of utmost importance to set out the priorities and choose the B-school aligning with those priorities. 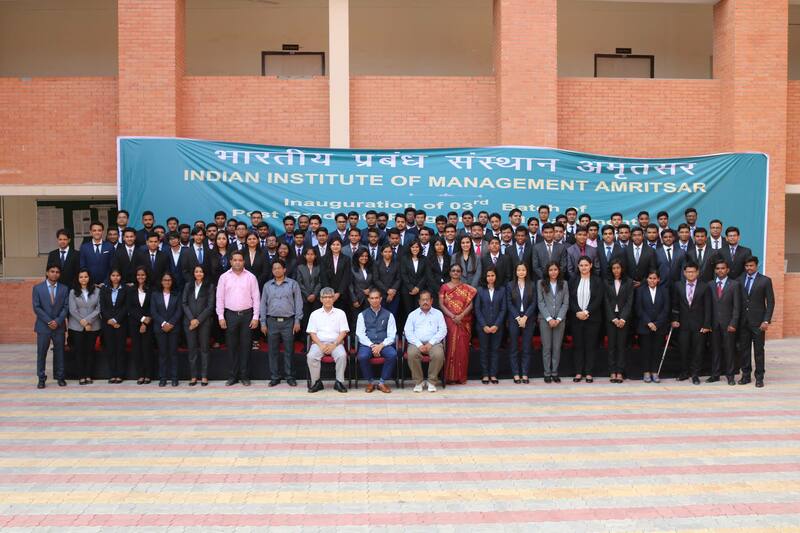 We, at IIM Amritsar enjoy a complete autonomy to set our priorities and prepare for the corporate challenges ahead. Dignitaries unveiling logo of [COE]Centre Of Entrepreneurship. With the recent inauguration of Centre Of Entrepreneurship [COE] which is a type of incubator set up to help budding entrepreneurs to assist them not only in their entrepreneurial ventures, but also to manage family businesses, IIM Amritsar has added another feather to its cap and has provided a platform and a point of guidance to its students. Apart from this, we regularly get to interact with top corporate honchos at HR conclave YUKTI, Finance & Marketing conclave PARIPREKSHYA, Strategy & Operations conclave SANKSHETRA apart from regularly organized guest lectures by top managers and CXO’s. This year was particularly important for IIM Amritsar as we successfully organized our first TedX event where top achievers from various fields shared their mantra for success. The event was well received by the students and gained some valuable life lessons by taking time out from their busy academic schedule. With the rapid emergence of digitization and social media, the transparency and also misleading tactics has been on rise on various online platforms. People often tend to promote their institute by displaying false information by referring malified and unreliable sources. As a result, students often get misleaded by such false propaganda. My sincere request to all the aspiring students to invest some time in researching about the institute,take suggestions from the alumni and make your decision wisely. Having said that, I thank you for taking time to read this article and welcome you to the world of excellence at IIM Amritsar-the Holy IIM. Well described..I must say the journey has indeed been enriching to all of us.